6 December 1963: Air Force test pilot Major Robert W. Smith takes the Lockheed NF-104A Aerospace Trainer, 56-0756, out for a little spin. . . Starting at 0.85 Mach and 35,000 feet (10,668 meters) over the Pacific Ocean west of Vandenberg Air Force Base, California, Bob Smith turned toward Edwards Air Force Base and accelerated to Military Power and then lit the afterburner, which increased the General Electric J79-GE-3B turbojet engine’s 9,800 pounds of thrust (43.59 kilonewtons) to 15,000 pounds (66.72 kilonewtons). The modified Starfighter accelerated in level flight. At Mach 2.2, Smith ignited the Rocketdyne LR121 rocket engine, which burned a mixture of JP-4 and hydrogen peroxide. The LR121 was throttleable and could produce from 3,000 to 6,000 pounds of thrust (13.35–26.69 kilonewtons). 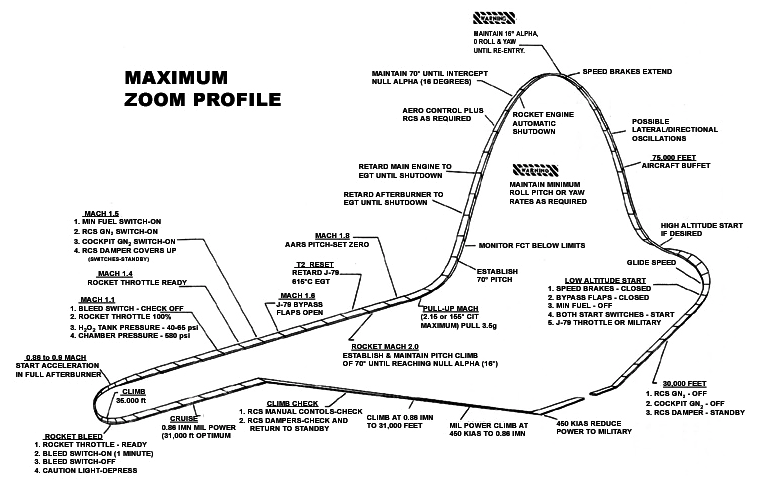 When the AST reached Mach 2.5, Smith began a steady 3.5G pull-up until the interceptor was in a 70° climb. At 75,000 feet (22,860 meters), the test pilot shut off the afterburner to avoid exceeding the turbojet’s exhaust temperature (EGT) limits. He gradually reduced the jet engine power to idle by 85,000 feet (25,908 meters), then shut it off. Without the engine running, cabin pressurization was lost and the pilot’s A/P22S-2 full-pressure suit inflated. The NF-104A continued to zoom to an altitude where its aerodynamic control surfaces were no longer functional. It had to be controlled by the reaction jets in the nose and wing tips. 756 reached a peak altitude of 120,800 feet (36,820 meters), before reentering the atmosphere in a 70° dive. Major Smith used the windmill effect of air rushing into the intakes to restart the jet engine. 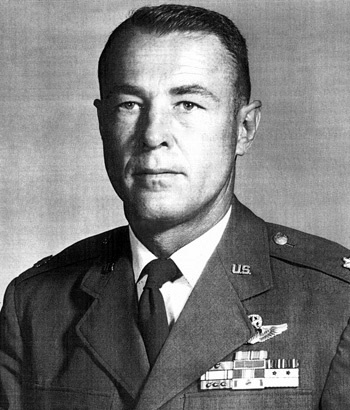 Major Smith had set an unofficial record for altitude. Although Lockheed had paid the Fédération Aéronautique Internationale (FAI) license fee, the Air Force had not requested certification in advance so no FAI or National Aeronautic Association personnel were on site to certify the flight. Robert Wilson Smith was born at Washington, D.C., 11 December 1928. He was the son of Robert Henry Smith, a clerk (and eventually treasurer) for the Southern Railway Company, and Jeanette Blanche Albaugh Smith, a registered nurse. He graduated from high school in Oakland, California, in 1947. Smith studied at the University of California, Berkeley, and George Washington University. Robert W. Smith joined the United States Air Force as an aviation cadet in 1949. He trained as a pilot at Goodfellow Air Force Base, San Angelo, Texas, and Williams Air Force Base in Arizona. He was commissioned as a second lieutenant, United States Air Force, 23 June 1950. Second Lieutenant Robert Wilson Smith married Ms. Martha Yacko, 24 June 1950, at Phoenix, Arizona. He flew the F-86 Sabre on more than 100 combat missions with the 334th and 335th Fighter Interceptor Squadrons of the 4th Fighter Interceptor Wing during the Korean War. 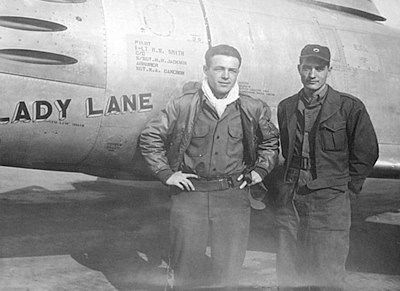 he named one of his airplanes Lady Lane in honor of his daughter. Smith was credited with two enemy aircraft destroyed, one probably destroyed and three more damaged. 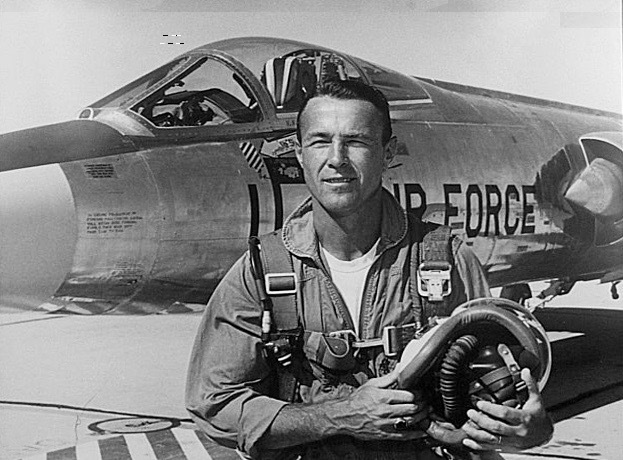 Smith graduated from the Air Force Test Pilot School in 1952 and flew more than fifty aircraft types during testing at Edwards Air Force Base and Eglin Air Force Base, Florida. He was later assigned to the Aerospace Research Test Pilots School at Edwards Air Force Base for training as an astronaut candidate for Project Gemini. After the NF-104A project was canceled, Lieutenant Colonel Smith volunteered for combat duty in the Vietnam War. He commanded the 34th Tactical Fighter Squadron, 388th Tactical Fighter Wing, at Korat Royal Thai Air Force Base, Thailand, flying the Republic F-105D Thunderchief. Bob Smith was awarded the Air Force Cross for “extraordinary heroism” while leading an attack at Thuy Phoung, north of Hanoi, 19 November 1967. He had previously been awarded the Silver Star, and five times was awarded the Distinguished Flying Cross. Lieutenant Colonel Smith retired from the Air Force on 1 August 1969 after twenty years of service. Lieutenant Colonel Robert Wilson Smith died at Monteverde, Florida, 19 August 2010. He was 81 years old. 56-756 was a Lockheed F-104A-10-LO Starfighter. Flown by future astronaut James A. McDivitt, it had been damaged in a landing accident at Edwards following a hydraulic system failure, 21 November 1961. 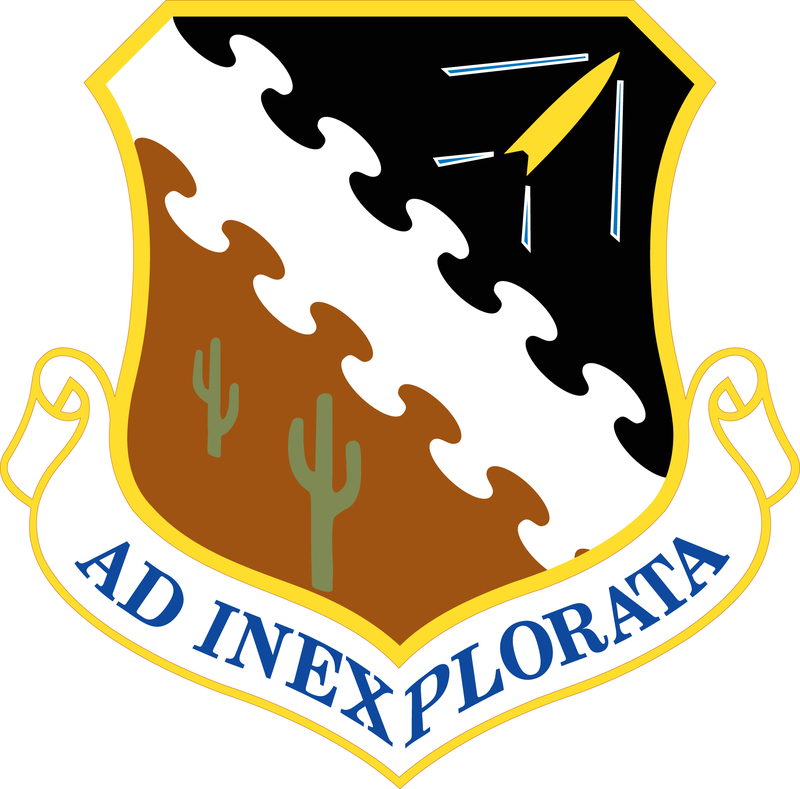 It was one of three taken from storage at The Boneyard at Davis-Monthan Air Force Base, Tucson, Arizona, and sent to Lockheed for modification to Aerospace Trainers (ASTs). These utilized a system of thrusters for pitch, roll and yaw control at altitudes where the standard aerodynamic control surfaces could no longer control the aircraft. This was needed to give pilots some experience with the control system for flight outside Earth’s atmosphere. The F-104A vertical fin was replaced with the larger fin and rudder from the two-place F-104B for increased stability. The wingspan was increased to 25 feet, 11.3 inches (7.907 meters) for installation of the hydrogen peroxide Reaction Control System thrusters. The fiberglass nosecone was replaced by an aluminum skin for the same reason. The interceptor’s radar and M61 Vulcan cannon were removed and tanks for rocket fuel and oxidizers, nitrogen, etc., installed in their place. The fuselage “buzz number” was changed from FG-756 to NF-756. The standard afterburning General Electric J79-GE-3B turbojet engine remained, and was supplemented by a Rocketdyne LR121 liquid-fueled rocket engine which produced 3,000 to 6,000 pounds of thrust (13.35–26.69 kilonewtons) with a burn time of 105 seconds. 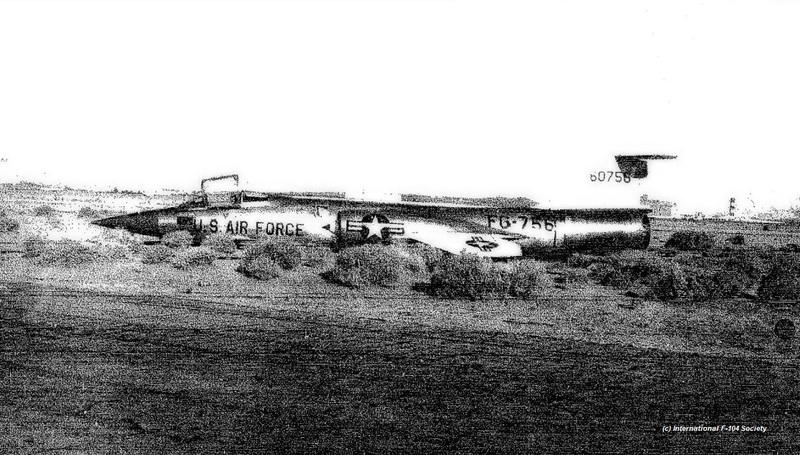 56-756 was damaged by inflight explosions in 1965 and 1971, after which it was retired. 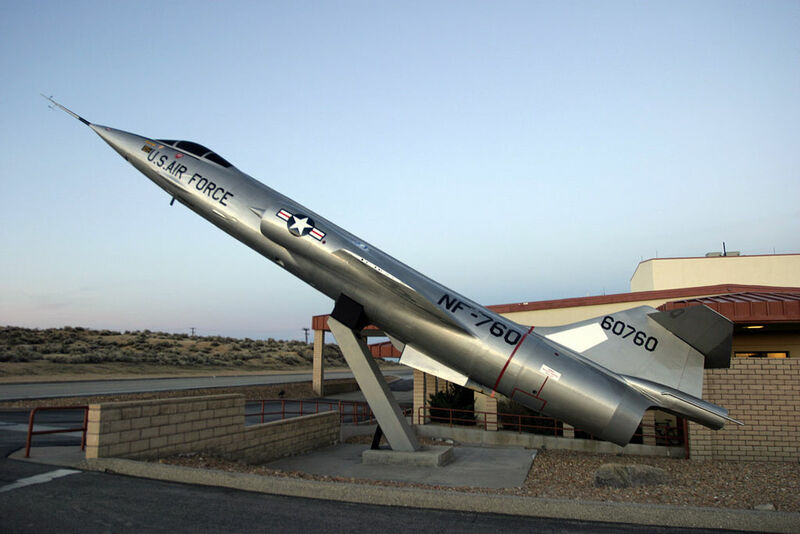 It is mounted for static display at the Air Force Test Pilot School, Edwards Air Force Base, California, marked as 56-760. Another one of my role models. Great story! is this the same type and model that Chuck Yeager flew and punched out of? I remember his 104 having the extra rocket but I was unaware of the extra flight controls that were built into the plane for high altitude control. I have been to Yeager’s 104 crash site previously and found the recording cameras build tag. On another note I was told of a couple of F4s that were also equipped for high altitude re-entry training, do you have any information regarding these planes? Great history lesson on Colonel Smith! Yes, JB. There were three NF-104 ASTs: 56-0756, 56-0760, and 56-0762. 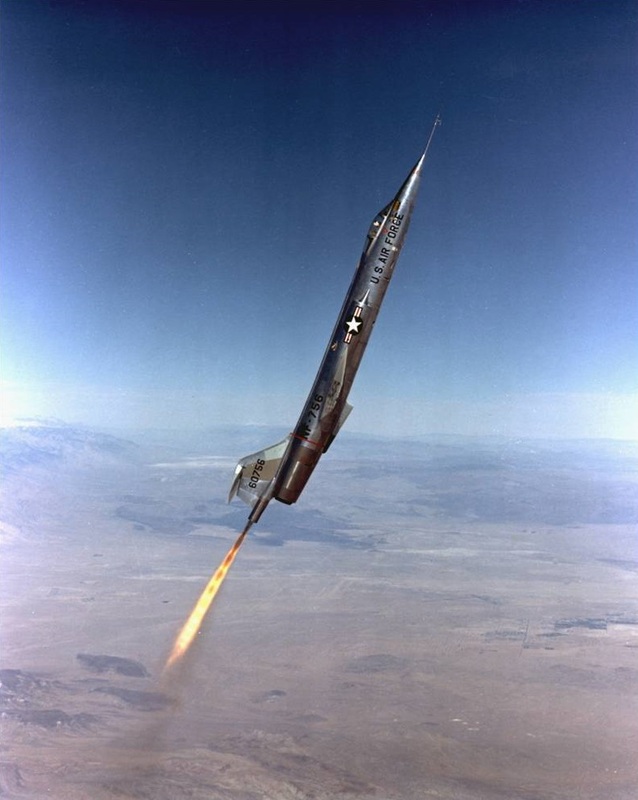 Yeager was flying the third, 56-0762, when it went into an unrecoverable spin, 10 December 1963.